A performance lecture on the historical and hidden meanings of Craft (see text below). 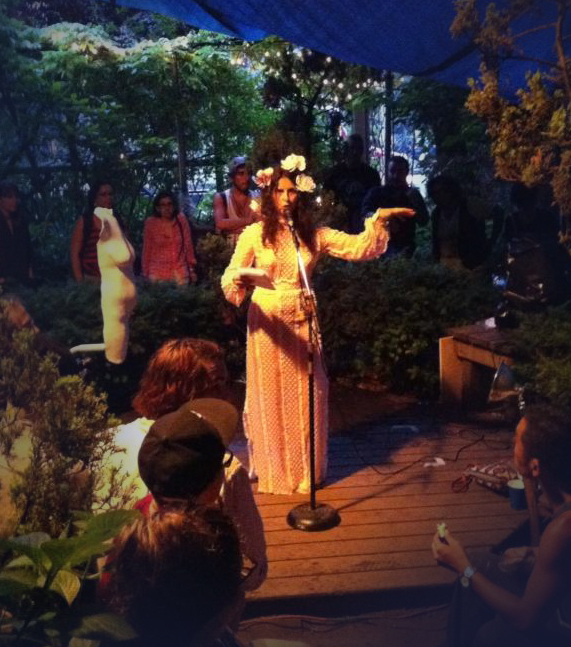 Written for Craftivism, held at Le Petit Versailles in Manhattan on July 12, 2013. But you, you have potential. You could be a body so pleasing. in your perfection all of my sins I atone! Bienvenue Mes amours au Jardin du Petit Versaille! We are here tonight to exult an ancient form of human culture and our ever renewing bond to it. Of course I'm talking about Craft. We are celebrating, honoring and unravelling the culture and process of making objects outside of industrial production. In the 21st century we are surrounded by objects of the industrial sort. What we touch, where we live, what we wear, what we eat. So we set aside spaces and moments to exult the objects that we make ourselves, or have the traces of fingerprints. We congratulate ourselves for noticing and seeking out these hand made things. We celebrate our connection to a culture disconnected from mass production, and all the unifying ways that making objects by hand connects us to each other. But I am reminded not to forget that most industrially produced objects are also hand made. The extraction of material, the forming of the components and the assembly, are most often produced with many hours of hand over hand. . . labour. And so I want to stop for a moment, and move deeper into this term that brings us here today, and weave together some of the strands of history and meaning that might broaden our thinking of the word. Small water craft. Not advisable in high wind or rip tide. Power over – to manipulate materials in the production of a new form. Clay into pots. Words into paragraphs. Bodies into populations. This was the initial impulse of the human condition – the desire to have power over the raging raw world whirling about us. to populate our surroundings with tools and sacred objects. The power of craft comes from the bumping together of beings. When planets are produced from the shattered remnants of an exploded star body. When a loaf of bread is made from the transformative relationship between water, flower and bacteria. When ones hands push into a wet mound of porcelain to produce a delicate dish. But to craft is also to Crave. And indeed the two terms come from the same route word. To crave is the impulse towards craft. The desire behind the exertion of power. But craving is a dual force, working from the outside and from the inside. And who is to say that one's cravings are not also crafted? The complex products of skillfully applied forces. What is it that acts upon your insides and knits together your yearnings and desires? There were many villages inside of her intestines. Microbial Manhattans, Bacterial Beijings. There was a closeness to their relationship. An indispensable intertwining of dependance. She was not without them, and them not without her. What is this inhabitance? Is it a colony? Is it purely science, dispassionately operating on digestion? Is it a possession, an energy that fills the host and controls it? Maybe it is the host. Perhaps she is not an entity at all, only the outward expression of this environment of complex infrastructure. What about her brain you ask? Is her brain not the seat of her person? Descartian separation aside, perhaps the brain is only one mechanism utilized for the survival of the Microbial culture, like the Hoover damn is to Los Angeles. However, when she thinks about these civilizations within her, she holds the belief that she can control them to some degree. She thinks of their role as minor, that they are tasked merely to metabolize her food – doing a simple process of chemistry. She has an industrial model as her reference, she imagines an unmanned factory floor, lacking consciousness, machines producing and being replaced, producing and being replaced. How she lacks imagination; how monocratically she views her governance. As we go wildly into the night this evening, I want you to cast a new vision of your own bodies. What are the forces that you employ to craft your experience, and be aware, there are many unseen crafty entities on your insides and out. Before I leave you, I want us all to break bread together. I have some here with me, and as my friends pass them out for us to share. I will read to you the recipe. Slit Bread: Spell to make one's audience fall in love with you. Or anyone else that you desire. Sprinkle yeast and sugar over warm water. Stir in 2 cups flour and salt. Mix until a stiff dough. Knead dough until smooth and elastic.